Shu cream is a Japanese dessert which translates to "cream puffs." It is based upon the French choux pastry where the puff pastry is baked to light and airy perfection with a thin yet slightly crisp exterior shell. The shell is then filled with a sweet, creamy, delectable custard filling. Before serving, shu cream is gently dusted with sweet powdered sugar. While the traditional shu cream has a plain puff pastry and yellow custard filling, another popular version of shu cream has a plain puff pastry shell but is covered with a generous layer of dark chocolate. Other versions of shu cream have flavored custard cream fillings such as chocolate, green tea or matcha, fruit flavors such as strawberry or blueberry cream, or even coffee or peanut butter flavored cream. Creativity is only limited to the chef, but the favorite is still the classic custard cream. 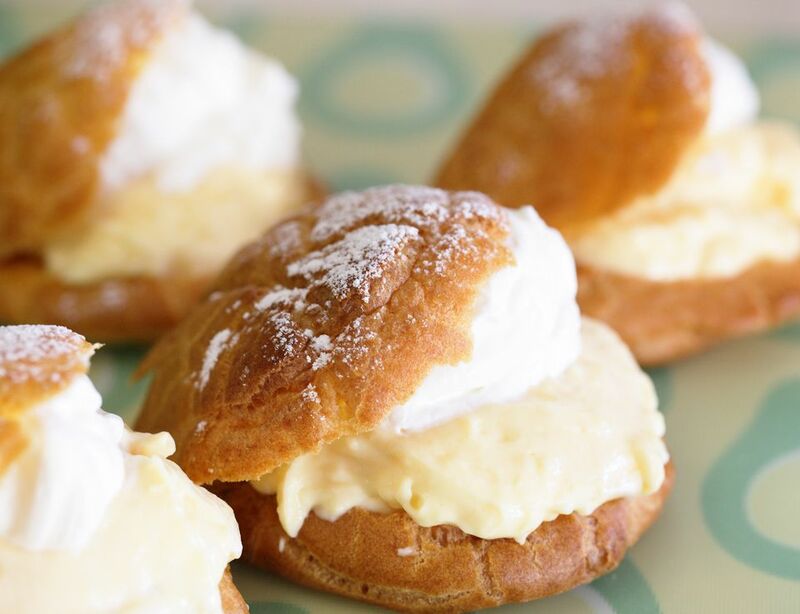 Cream puffs are available in smaller one-bite sized puffs, or there are larger cream puffs which require at least a few bites to finish. Put butter, sugar, and water in a pan and bring to a boil over medium heat. Add flour to the pan and incorporate into the butter mixture, making sure to stir quickly. Turn off the heat and remove pan. Add the beaten eggs slowly into the pan with the butter and flour dough mixture, stirring well. Place a piece of foil or a silicone baking sheet on a baking pan. Take a disposable, recloseable plastic bag and snip the end off one of the corners with scissors. Or, use a pastry bag, if you have one. Put the dough in the plastic bag, and gently squeeze out small mounds of dough onto the pan. Make 8 or 9 mounds of dough. Bake the puff pastry in the 375 F oven for 30 minutes. Cool the puffs, and then cut them in halves horizontally. Mix the egg yolks and sugar in a pan. Add sifted flour to the pan and mix well. Place the pan on low heat and stir the mixture constantly until thickened. Stop the heat and add melted butter and stir well. If you prefer, try making matcha or green tea flavored custard cream filling. To make matcha flavored custard cream, dissolve 1 tsp of matcha green tea powder in 2 tsp of water in a small bowl and mix well. Add a few spoonfuls of the custard cream into the green tea and mix well. Then add the green tea and cream into the rest of custard cream. Mix well until fully incorporated. Fill the bottom halves of puffs with custard cream and place the top halves on top. Dust the finished cream puffs with a sprinkle of powdered sugar.